We're crazy about smothered enchiladas stuffed with beans and cheese… but we don’t enjoy the sky-high calorie, fat, and carb counts that tend to tag along. Well, in this HG recipe, the starchy tortillas get swapped out for slim sheets of eggplant. 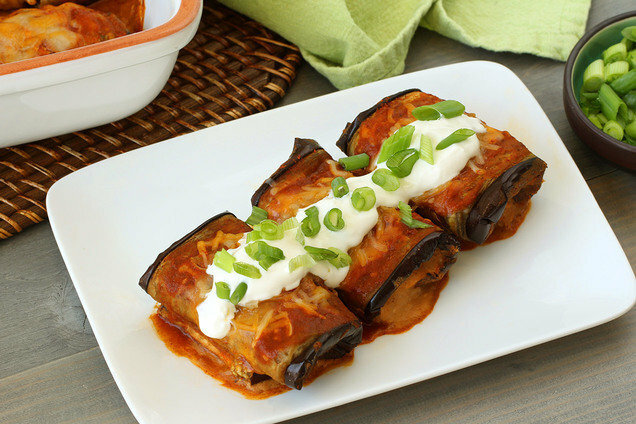 A few more ingredient swaps, and you’ve got zesty enchiladas with less than 70 calories a pop! Preheat oven to 375 degrees. Spray a baking sheet and an 8” X 8” baking pan with nonstick spray. Lay eggplant on the baking sheet, and sprinkle with 1/4 tsp. each cumin and chili powder. Bake until slightly softened and lightly browned, about 12 minutes per side. Meanwhile, in a medium bowl, prepare filling. Combine beans, 2 tbsp. enchilada sauce, cream cheese, and remaining 1/4 tsp. each cumin and chili powder. Mix until mostly smooth and uniform. Lay eggplant slices vertically on a dry surface. Distribute filling among the bottoms of the slices. Carefully roll up each slice over the filling, and place in the baking pan, seam side down. If needed, use toothpicks to secure. Evenly top with remaining 1/3 cup enchilada sauce. Bake until hot and bubbly, about 15 minutes. Hungry for More Healthy (& Meatless!) Mexican Recipes? Save your buddies from boring food! Click "Send to a Friend" now.